Everyone is entitled to be an architectural critic, especially of one's own environment. Since I studied and worked at Harvard for almost half a century, this is theI have a list of its buildings that I believe should be taken down immediately. If not sooner. They despoil both the skyscape and the landscape, most of them brutally fulfilling the threat inherent in their style, i.e., the "brutish" style. Fate has not been kind to YamasakI's work. Erected in the 1955, the Pruitt-Igoe housing project in St. Louis was torn down in 1972 simply because people couldn't stand living in it. The World Trade Center suffered a cataclysmic fate which, of course, it did not deserve. But that is a very spare compliment. They look like the buildings in Queens to your right on the highway between LaGuardia and JFK airports. The Boston Globe architecture critic Robert Campbell did a classic essay, "Why Don't the Rest of Us Like the Buildings the Architects Like?," in the summer 2004 number of the Bulletin of the Academy of Arts and Sciences, focusing on Peabody Terrace. Jose Luis Sert, an exile from the Spanish Civil War, was its architect and also a very short man. This meant that the ceilings in Peabody were unusually low. The terraces invited tenants to hang their laundry, perhaps to evoke for Sert the peasants of his native Catalonia. 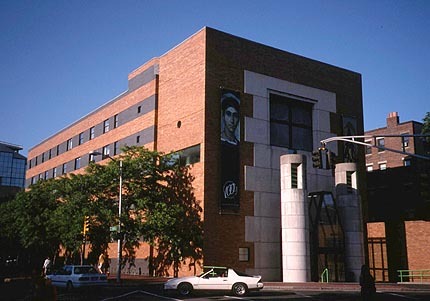 Alas, Sert and his studio also designed the most self-indulgently sprawling multi-story, full-block ugly erection in town, Holyoke Center, and the one that made Harvard Square a nightmare to cross and a center of drugs and drugged out young people not drawn to the university for books or teaching. This was the brutish style triumphant, and I have always wondered what the thenpresident, the genteel but altogether unintellectual Nathan Marsh Pusey, made of his own complicity in turning the operational ganglion of the academy into something like Times Square. Which brings me to a different part of the Harvard Art Museum complex that is not a candidate for destruction but is already scheduled to bite the dust. 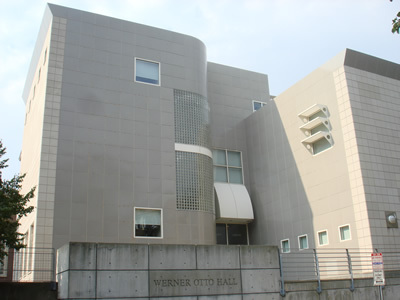 It is Werner Otto Hall, and it was opened as an attachment to the Fogg, the same Robert Campbell tells us in Sunday's Boston Globe, in 1991. Seventeen years later, it is finished. Kaput. Here is a picture of the outside of Otto Hall which housed the collection of the Busch Reisinger Museum of Germanic Art which, more or less went underground during World War I and is now occupied by the Center for European Studies, the closest thing to the EU there is. It is the outside walls of the museum wing and its connections to internal mechanical systems that have gone wrong, and apparently these cannot be repaired. Anyway, as Campbell writes, "Otto's problems were never fixed. Nothing worked quite right." Cambridge's "cold dry winters" were only part of the problem. So who will design the new Fogg Museum in which Otto may or not have a place? Who will deal with the Cambridge "cold dry winters?" It is Renzo Piano, winner of the Pritzker Prize in Architecture and co-designer with Richard Rogers of the Centre Pompidou-Beaubourg museum in Paris. 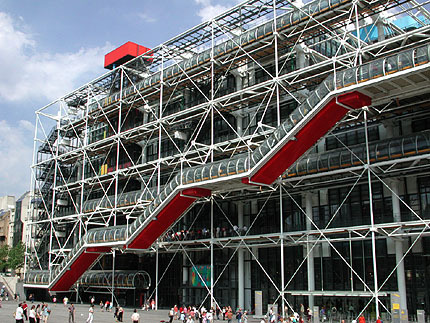 Opened in 1977, the Pompidou had to close down in 1997 for fully three years so that precisely its outside could be redone. Yes, again, in just 20 years, the museum was unusable. The enormous tubular piping with the bright colors had begin to rust and other functional elements were deteriorating. I believe that $100 million was needed to touch up the exteriors. And now back to Walter Gropius, the master of the Bauhaus and the architect of Harkness Pavillion and five graduate student dorms. Everyone hates them. Harkness. which is real a student center has currently been more or less physically absorbed by a building done by Robert A.M. Stern, the triumph of kitsch over dreariness. I lived in one of the dorms for three weeks in my first year of graduate work. Gropius must have imitated an archetypal prison for this student housing, long corridors, cinder block, tiny rooms, windows that looked out on other windows, shower and bathroom for everyone on the floor, together. But, of course, it is Gropius, an icon of twentieth century civilization. How long will the ordinary lives of students be dominated by a vision of working class housing that makes housing for workers in Beijing look commodious?